Comprehensive software solutions for optimized direct to garment printing. Getting a perfect print on the garment of your choice is easy with the help of AnaJet’s RIP software. Use the included AnaRIP software to quickly process images. For advanced functionality and ultra-optimized profiles for even brighter, more accurate colors, choose Kothari Print Pro. 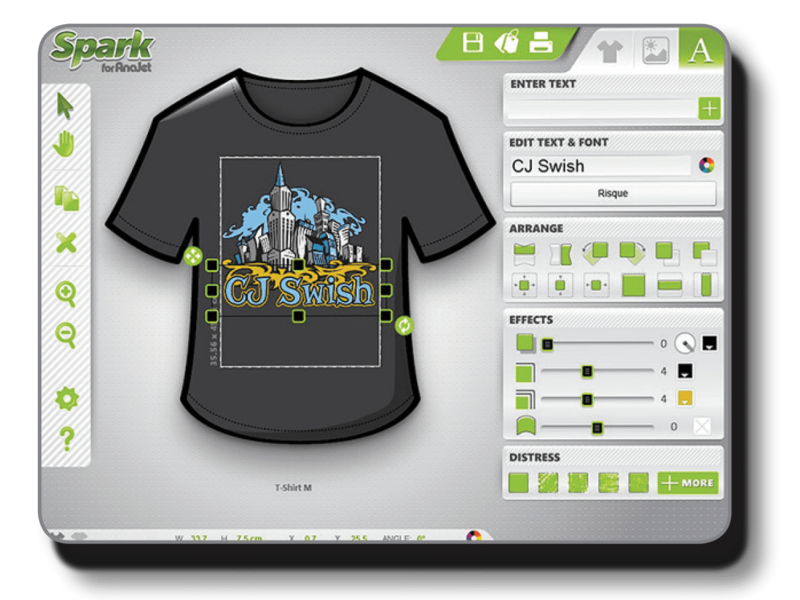 The optional Spark Design Software allows you to personalize your graphics. AnaRIP software is intuitive and easy to use. Included with your printer purchase, AnaRIP helps you get started printing as quickly as possible. AnaRIP's default profiles are optimized to provide beautiful results in most printing scenarios. For highly specialized prints, included tools make further custom adjustments a breeze. When it comes to DTG printing, all images must be processed and exported as a printer-readable file. AnaRIP is designed for use with your machine and rips images in seconds. Preview your design in true color. AnaRIP TrueView accurately matches colors on your monitor with your shirt color, so you can see how your printed garment will look when it's complete. AnaRIP accurately measures the amount of ink required and how much it will cost, helping you to set shirt prices more easily. 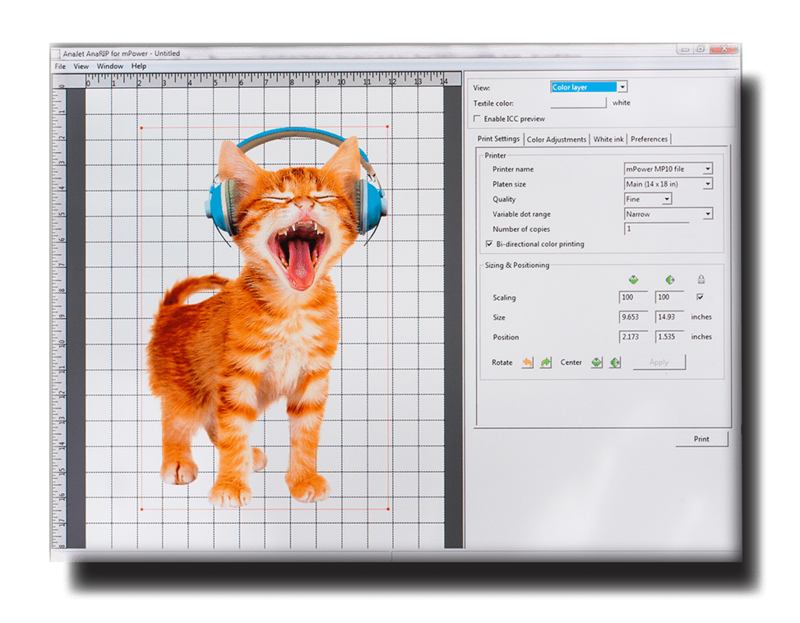 High-performance DTG printing demands high-performance RIP software. Save money and enjoy ultra-optimized color profiles and advanced functionality with Kothari Print Pro created by industry leader, Kothari Info-Tech. Get brighter, more accurate colors with Kothari Print Pro's expanded set of highly optimized print profiles. Kothari Print Pro even helps you save money by reducing ink usage on black garments by up to 44 percent when compared to AnaRIP software. * Utilizing an advanced algorithm based on the garment's color, the software minimizes waste by more accurately calculating the amount of ink needed to complete your print. *Ink usage test performed on black t-shirts using a set of standard sample images printed in "White Highlight" mode with default settings. 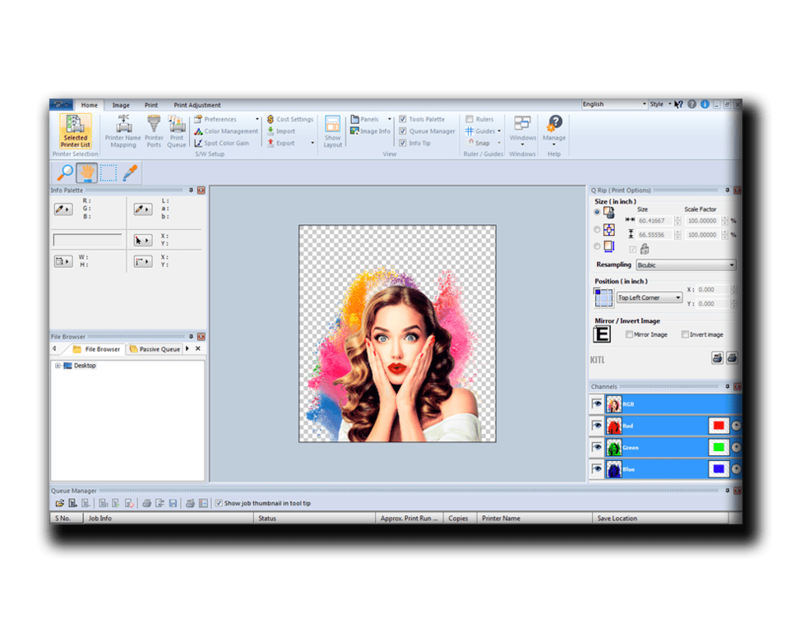 Unlock the power of Kothari Print Pro software with advanced features: Directly manipulate RIP image colors, load and position multiple images on the fly, and more! Highly intuitive yet powerful user interface allows you to customize graphics. Change shape, adjust size, add text, adjust colors, add texture and more. Easily apply drop shadows, double outline effects, distress and more to the designs you create. The Spark software is custom designed to seamlessly work with the AnaRIP software. Simply press print and the Spark software automatically rips the file for the printer. Spark gives users full control over pricing options, customizable to fit your business needs. Get instant quotes by setting your own unit costs, selling prices, discounts, tax rates, etc. as primary scratch space for storing image files). 100GB or more free hard disk space.